Modernist Jewelry - This is an original sculptural sterling silver ring beautifully handcrafted featuring a natural round freshwater white cultured pearl (10mm). This unique ring has a wide shank and is adjustable for easy sizing. 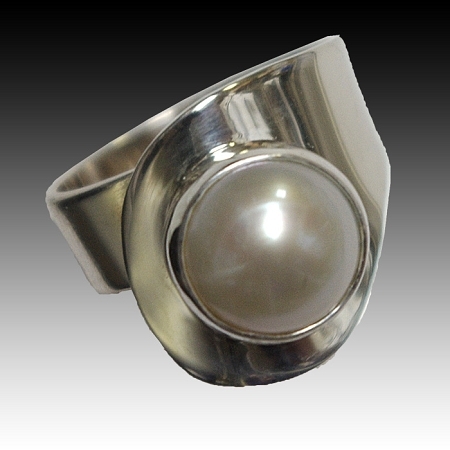 This is an original sculptural ring beautifully handcrafted featuring a freshwater cultured white round pearl. This ring has a wide shank in the back that is designed for comfort, but also helps the ring to stay in place and to not turn around. Because of the unique design, the shank is adjustable for easy sizing. This ring will make a statement on its own or as part of a set. This ring complements all of our jewelry collections. Shank in the back is 6.8 mm wide. The Pearl is approximately .39" wide (10 mm). Pearls are said to alleviate headaches and migraines. Pearls can reduce allergies. Psychologically, pearls promote wisdom and contentment well into old age. This is a truly unique piece that is designed, created, and signed by Aaron Rubinstein and Modern Art Jewelry. We accept custom orders. Each purchase is shipped in a beautiful presentation box to impress your loved one. We also gift wrap and, if you would like, provide a handwritten card.